What Day Of The Week Is June 28? 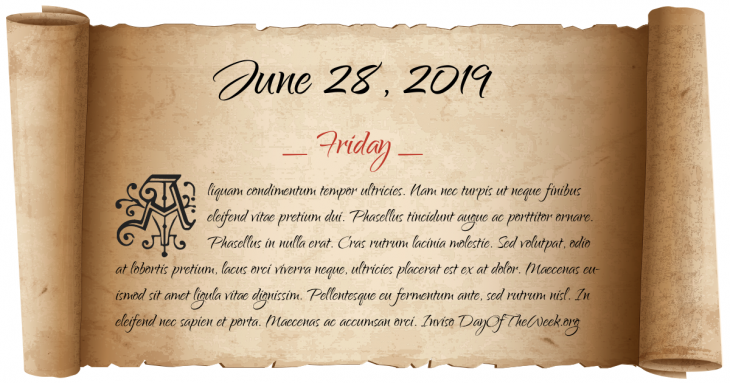 June 28, 2019 is the 179th day of the year 2019 in the Gregorian calendar. There are 186 days remaining until the end of the year. The day of the week is Friday. This date is the only date each year where both the month and day are different perfect numbers, June 6 being the only date where the month and day are the same perfect number. American Revolutionary War: Battle of Monmouth is fought between the American Continental Army under George Washington and the British Army led by Sir Henry Clinton. The Cominform circulates the “Resolution on the situation in the Communist Party of Yugoslavia”; Yugoslavia is expelled from the Communist bloc. Seoul is captured by North Korean troops. The United States Supreme Court, in Regents of the University of California v. Bakke bars quota systems in college admissions. Members of the Aum Shinrikyo cult release sarin gas in Matsumoto, Japan; 7 persons are killed, 660 injured. Who were born on June 28?